Because there’s really no point in having brakes on a stroller’s wheels if they still allow the stroller to roll, our colleagues at Consumer Reports have judged a double stroller from Graco a “Don’t Buy: Safety Risk” and shared their findings with both the company and federal safety regulators. As part of CR’s stroller testing process, it places each stroller on a tilt-table and puts the brakes under stress by angling the table up to a 20-degree incline. 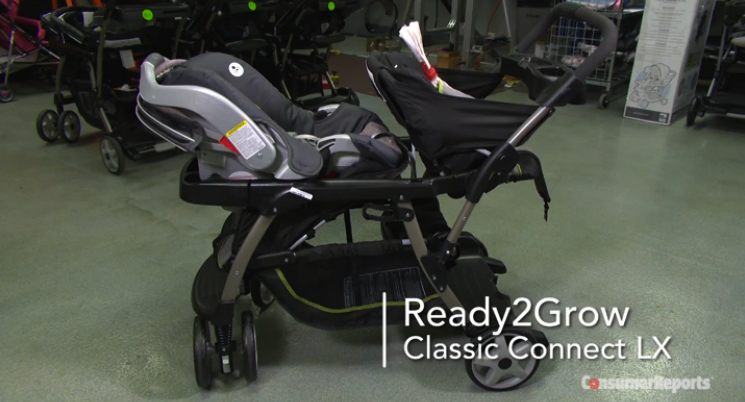 The Ready2Grow Classic Connect LX was the only on of the more than 160 strollers that began to roll when placed on an incline. The test was repeated on a second Ready2Grow Classic Connect LX and it too began to roll as the incline neared the 20-degree mark. According to CR, the braking system on this stroller uses plastic teeth that are supposed to cause the wheel to lock, but when testers looked at both of the strollers that rolled during testing, they found several teeth that were bent and showing stress marks. A third test stroller that had not been through incline testing, but whose brakes had been used during testing on level ground, showed early signs of bending and stress. Consumer Reports has told both Graco and the U.S. Consumer Product Safety Commission about its findings. For its part, Graco maintains that the Ready2Grow stroller performs safely and reliably, and questions the real-world relevance of the CR braking test, which is steeper than the voluntary industry-standard test that uses a 12-degree incline. There is no evidence of any brake-related injury for the Ready2Grow Classic Connect LX. Consumer Reports points out that the voluntary industry standard will be replaced in September 2015 by a mandatory federal standard that includes a test that approximates the force applied to the brakes by a 20-degree incline. Graco says it is in the process of upgrading the brakes and that a new system will meet the federal standard.